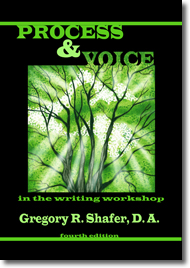 "This book is an electronic hands-on support. It is for those who think they want to become a school principal, who definitely want to become a school principal, who are actively preparing to become a school principal, and who are presently principals. No theory—practical information that addresses the various challenges experienced in the profession." 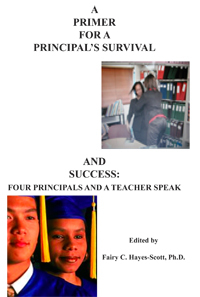 — Editor Fairy C. Hayes-Scott, Ph.D.
A Primer for a Principal's Survival and Success: Four Principals and a Teacher Speak. Edited by Fairy C. Hayes-Scott, Ph.D.
Editor: Fairy C. Hayes-Scott, Ph.D.
First, this book is not for the person who wants information about studies about how to become a school administrator or statistics related to schools at risk. This information can be ascertained in any graduate level, university course. This book is an electronic hands-on support. It is for those who think they want to become a school principal, who definitely want to become a school principal, who are actively preparing to become a school principal, and who are presently principals. No theory—practical information that addresses the various challenges experienced in the profession. Four individuals who have served or is serving in this role answer questions posed by the editor/author that focus on challenges that principals do experience. In addition, this work adds responses from a seasoned teacher. Finally, accompanying this e-Book is an electronic DVD, Cases of Concerns, that dramatize real challenges that principals face, bullying resulting in a violent response, parental responses to a situation, conflict in a tutorial session, and conflict between workers. The principals give insight on how they would have avoided and/or handled these conflict situations. This e-Book is for the person who wants more than textbook about educational administration. It is a publication that provides quick electronic access to answers for the principal who needs a resource that addresses a wide range of challenges s/he will face. Lisa R. Anglin, Ed.S., is an educator in the Ann Arbor [MI] Public School District. She currently serves as an assistant principal at Pioneer High School. Her current role as a Class Principal for the graduating class of 2014 allows her to support nearly 400 students in this cohort, as well as over 100 senior students within the class of 2012. In addition, she is the unit administrator over three core departments within the high school, including English/Language Arts, Social Studies, and Math. This is her third year serving as an administrator. Arlene Barnes, Ed.S., recently retired from the Ann Arbor Public School System and has worked in various capacities in the school district. She has served as a secondary mathematics teacher, guidance counselor, department char of both guidance and counseling and special education, dean of students, assistant principal, principal, central office administrator, and equity facilitator. Sandra Harris, Ed.D., recently retired from the Oak Park [MI] Public School District as the Superintendent of this school district. She, too, has served in various capacities in Education. She began her career in the Ann Arbor Public School District. She continued as a Vocational Coordinator, Assistant Principal, and Personnel Director in the district. Then, worked in the Lincoln Consolidated Schools at an Assistant Superintendent and Superintendent. Her final move was to the Oak Park School District where she served as the Superintendent. Denise Lilly, MA, is currently serving as a school principal. She began her career teaching in the Ypsilanti [MI] Public School District. She continued her role as an educator serving as a Department Chair and Acting Assistant Principal. Later on, she moved to the Monroe [MI] Public Schools to become an Assistant Principal. A few years later, she moved to the Plymouth-Canton [MI] Community Schools to serve as Building Principal at one of its 16 elementary schools. Currently, she is Principal at a middle school in Plymouth-Canton. Fairy C. Hayes-Scott, Ph.D., began her career at Greenhills Schools in Ann Arbor. She has taught English at Hope College in Holland, MI. For over 30 years, she has taught English Composition, literature courses, American Sign Language, and lecture courses at Mott Community College in Flint, MI. Also, during these years, she has served as Supervisor of student teachers at Eastern Michigan University. In addition to her educational responsibilities, Dr. Hayes-Scott is an owner/publisher of two publishing companies and an author/editor of five books.